In the field of design there is one important principle that prevails. This is the understanding that excellent design should not only be attractive to look at, but also must function extremely well. We know that the dumbell design of the rattle is pleasing to look at as it is used in probably every fitness gym for the strength training weights, and has been for many years. They come in several sets of varying sizes which means different weights. 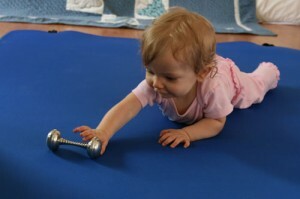 For baby, the design of this rattle is excellent for motor skill development. 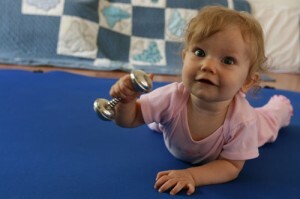 You can read our post “Best Baby Rattles” to learn more about rattles and motor skill development in infants. This entry was posted in FIVE SENSES, GRASPING & REACHING, RATTLES and tagged play, strength. Bookmark the permalink. These are so touching. I love the color. This little baby is so precious! I love the outstretched arm, the hair, and the embrace of the rattle. What a beautiful shot!